Another group, CNP Action, sent a letter directly to Trump on Friday, praising Pruitt’s actions at the EPA. “We write to thank you for your ongoing support of EPA Administrator Scott Pruitt and to add our names to a growing list of people who recognize him as a capable administrator who is finally reining in the EPA and restoring its core mission,” CNP Action’s letter read. Most of the letter’s signatories added their names to the Conservative Action Project letter as well. The Congressional Western Caucus also released a statement in support of Pruitt with remarks from Congressional Western Caucus Chairman Paul A. Gosar, R-Ariz.; House Science, Space, and Technology Committee Chairman Lamar Smith, R-Texas; House Committee on Appropriations subcommittee on interior, environment, and related agencies Chairman Ken Calvert, R-Calif.; and Western Caucus members Reps. Doug LaMalfa, R-Calif.; Louie Gohmert, R-Texas; and Markwayne Mullin, R-Okla. The outpouring of support came amid new calls on Pruitt to step down from his post. The EPA chief has faced criticism for his first-class travel, Washington living arrangements, and staff salaries. 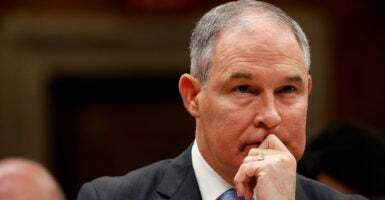 Pruitt, in interviews with The Daily Signal and Fox News this week, defended his actions and said he is taking steps to correct problems at the agency. For some lawmakers, including three Republican members, that’s not enough. This week, Reps. Elise Stefanik of New York, and Carlos Curbelo and Ileana Ros-Lehtinen of Florida called on Pruitt to step down. House Minority Leader Nancy Pelosi, D-Calif., announced Friday that she also wants Pruitt to resign, claiming he has brought a “culture of corruption, cronyism and incompetence” to the EPA.